Perhaps because it had been so hot until last weekend. Perhaps because I am enjoying more simplicity in my decorating. Perhaps because I am not rushing time and am choosing to ease into each season. Whatever the reason, I have not done a lot of fall decorating this year. But on Saturday, I added a few autumn touches, including a pair of wheat bundles on the mantel. It feels simple and just right. At a family gathering this past summer, Peter said that he wished he could drink some coffee, so we told him we'd invite him to share coffee with us some Saturday morning. And if you're drinking coffee, why not have some donuts too? We had another of our Shakespeare Reading Days this week. This time we read a comedy, As You Like It. We'll do another play in the spring, and then I'm retiring. Ron and I succumbed to this bag of fall temptation. What do you think? Would you try them? I have watched this video so many times since a friend shared it. (Thank you, Paula!) Beautiful, encouraging, comforting words of truth. Maybe you'd like to listen too . . .
What another lovely post! You inspire me. Thanks for the song, I'd not heard it before and it is very good. You are so kind, Lorraine! I'm glad you loved the song too! Cheryl, your wheat bundles--sooo pretty. Autumnal but not over the top! How did Peter like his coffee? My husband has never even tasted coffee once in his entire life! No on the pumpkin spice caramels for me. I'm a purist--if I'm going to eat a caramel, it has to be a classic. Love the idea of Shakespeare Reading Days! I am having a hard time relating to your husband! I prefer a classic caramel too, but I am sure that these will not go to waste. Shakespeare Reading Days are lots of fun! What a beautiful song, thank you. I'm glad you loved it too! Oh, those words . . . Loved your Five on Friday. My young nephew (years ago now) was thrilled to bits when we went to Tim Horton's to have his first very own coffee. It was the very first thing he excitedly told his dad when I dropped him off. The joys of 'firsts'. We had donuts with ours too. And, you are sitting around reading Shakespeare! I love it! Sweet story! It is a thrill for little ones to be given their very own coffee! Shakespeare Reading Days are a fun way to experience a play. It would get a bit tiresome for Bekah and I to read all the parts, so we invite others in to share the fun! We've been doing it since Kati was in high school, so we've read quite a few plays this way. Such a beautiful worship song! I love it too! Such wonderful words! What a beautiful post and a beautiful song! Thank you, friend, and I'm happy that you love the song too! Such a message! My babushka would let us drink coffee/chai a mix of coffee, water and milk when we were little. :) Happy weekend to you. It is a great song to share! Thanks for sharing your sweet memory of drinking coffee with your babushka! Reading Shakespeare aloud is one of the best ways to enjoy the story and the language. I see you have a No Fear edition there - aren't they great? We use them with our International Students here. 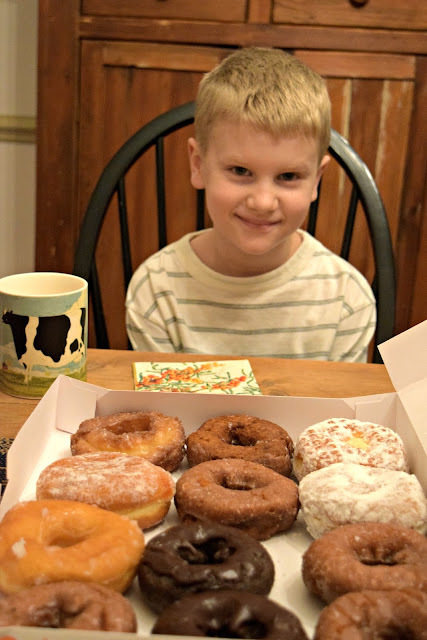 Your grandson is so sweet to want to join you for coffee (and donuts). I don't drink coffee ever, but do enjoy tea! I love the No Fear editions! Although I am a coffee lover through and through, I do enjoy a cup of tea on cool evenings. I have recently discovered Vanilla Almond by Republic of Tea. Wonderful! Sunday Snapshots: October Birthday Celebration! More Changes in the Kitchen!